In a large frying pan saute minced garlic. When garlic is slightly browned, add spinach and toss until wilted. In a large bowl with an electric mixer, blend 2 cups of cheese, the spinach and garlic blend from above, and artichoke hearts until well combined. Next add cream cheese, sour cream, mayonnaise and salt to the mixture and blend thoroughly. Pour into casserole dish and top with the remaining 1/2 cup of cheese. Bake for 25-30 minutes, or until cheese is golden and dip is bubbly. 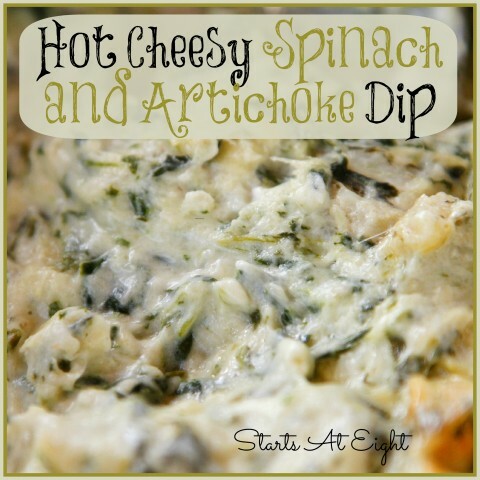 Serve your Hot Cheesy Spinach and Artichoke Dip with crackers, chips, toasted bread, pretzels, or anything else you might enjoy!